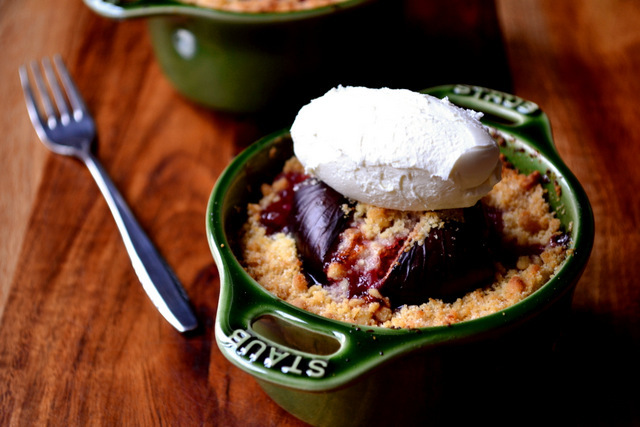 Is there anything more attractive than a fig perched in a nest of sweet pears and buttery crumble? Of course not. These individual Fig and Pear Crumbles are a great way to impress family members and dinner guests alike at this time of the year. But be quick; fig season is almost over and they’re nigh impossible to get your hands on at a reasonable price once winter hits. As mentioned in a previous recipe, a fig provides an exceptional focal point for any dish. I hope you’ll agree that these beautiful purple jewels, punctuated by hundred of tiny, crunchy seeds and nestled indulgently within buttery crumble make for a feast worthy of both your eyes and your stomach. As you’d expect, the flavour of these fig and pear crumbles matches their aesthetic appeal. A last-minute addition, using two-types of ginger to subtly flavour the desserts proved to be a stroke of genius, supplying that gentle spice so often craved in winter. Just make sure not to over do it; use too much ginger and it’ll drown out the flavour of the fruit and spoil the main event. Digging into that warm, luscious fig is an experience to be savoured. Read the word ‘individual’ in a recipe and it usually makes you think fiddly and time-consuming thoughts. When it comes to these little fig and pear crumbles, however, assumptions of that nature couldn’t be further from the truth. There is no peeling, pre-cooking or waiting around. You simply place the pears in their vessels, sprinkle with a little sugar, pop in a fig and finish with buttery crumble and cook. Job done. That’s what makes them perfect dinner-party fodder and the ideal quick-fix for a bothersome sweet tooth. Preheat the oven to 190C(fan)/170C. In a large mixing bowl bring the flour and butter together with your fingers until they resemble breadcrumbs. Add the sugar and ground ginger and mix thoroughly. Set aside. 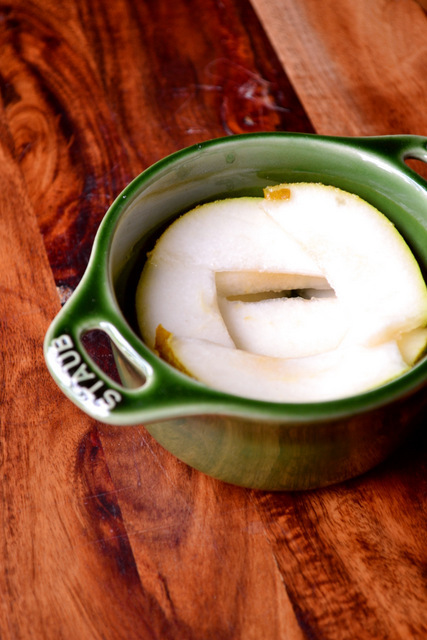 Take 4 large ramekins – roughly 4 inches in diameter – and layer the slices pears inside, leaving a small indent in the centre. Sprinkle each with ½ tsp of soft brown sugar and an equal amount of stem ginger. Leaving them connected at the bottom, slice the figs in quarters; fan them out slightly and place in the centre of the ramekins. 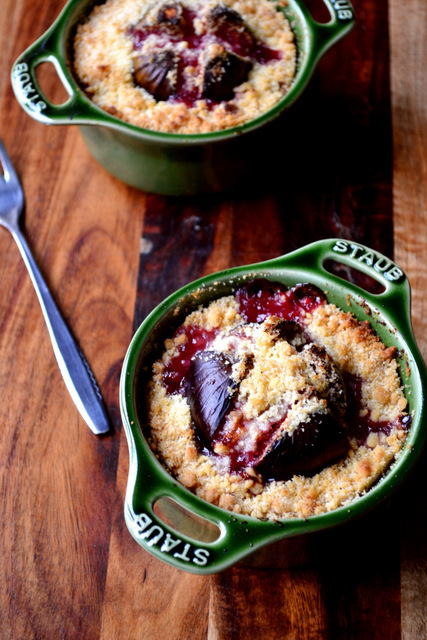 Scatter the prepared crumble atop the figs and pears, press down slightly and pop in the oven. Bake for around 30 minutes until piping hot and golden brown on top. Serve each immediately with a teaspoon of mascarpone cheese. Cost: At 4 for £1, figs are irresponsibly inexpensive at this time of year and should be consumed excessively. Pears, too, are in season and cheap as – proverbial – chips. As such, these delicious easy to make desserts are not only a quick-fix, but make an indelible impression of thrift. They can be made for as little as £2.50 with a little clever shopping. Fabulous! I like the big pear slices. Me too, Rosemary. It was nice to have a crumble with whole fruit. roughly how long do these little beauties have to bake for? Well spotted! The recipe has been updated. Thanks. Wonderful recipe! The addition of ginger, I bet, elevates the whole thing to the next level. And I would get a lot of satisfaction at packing those ingredients into individual dishes. Lovely! 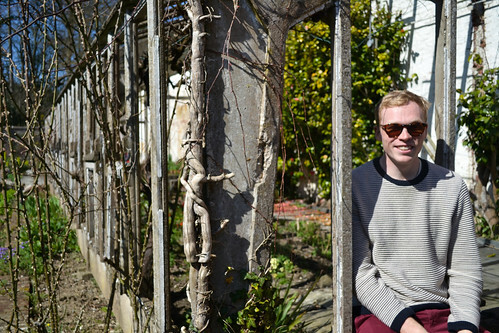 Thank you – yes, the ginger really was an excellent addition. YUM!!!! And those little ramicans (?) are amazing!! So doing this in the next fig season! Gorgeus ad very creative recipe. That’s it. I’m posting a fig thing tomorrow. This looks fantastic. Great after an Autumn cycle, I’m sure. You’ve mixed together some winning ingredients here, Nick. Well done, sir! Thank you, the ginger was especially delicious. Thank you! 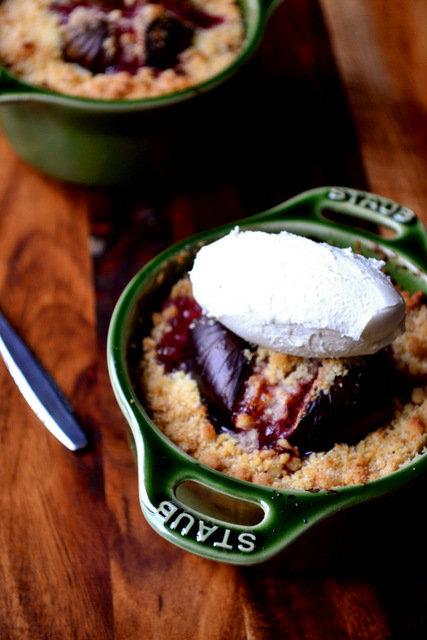 I can’t wait to try some more fig recipes next year – they’re wonderful. I love the idea of combining figs with pears…pretty and delicious. The combination is wonderful, especially with ginger.